For David Hedin – a man accustomed to working with elementary particles traveling at nearly the speed of light – there’s just no slowing down. And that’s saying something, considering that Hedin’s long record of achievements first earned him an NIU Board of Trustees Professorship in 2009. Since then, his research and student engagement efforts have only accelerated. He has co-published more than 30 papers – a year. Over his career, he has received more than $10 million in external funding – more than one quarter of that since 2008. He is the longtime director of graduate studies for physics and is currently supervising three graduate students, four undergraduate research projects and a research rookie. Most notably, Hedin is leading NIU’s involvement in development of a $250 million Mu2e experiment at Fermilab. By seeking to find rare conversions of particles known as muons to electrons, the experiment will look for new phenomena beyond the Standard Model of physics. It is already proving to be a boon to NIU physics and engineering students. “Professor Hedin is leading the NIU effort, comprised of more than a dozen faculty, scientists and students, and has already been elected to the executive committee for the experiment,” says NIU physicist Gerald Blazey, on leave to serve as a senior policy adviser in the White House Office of Science and Technology Policy. “His leadership in this area beautifully positions NIU for future productivity and prominence in high energy physics,” Blazey says. It’s no surprise, really. Hedin has done it before. Since 1976, he has been conducting research at Fermilab. 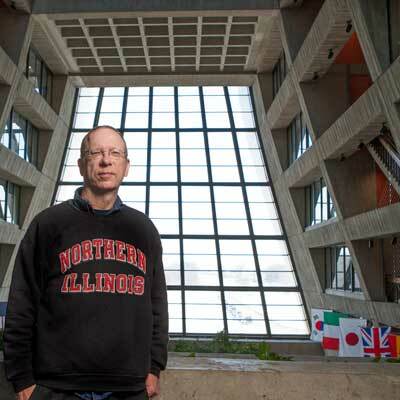 And, more than 25 years ago, he formed NIU’s experimental high energy physics group. Hedin is among the founding fathers of the DZero collaboration, a world-famous experiment that involves hundreds of scientists from across the world. Using Fermilab’s Tevatron collider, they explored nature’s forces and observed the smallest things ever seen, such as particles inside a proton. While involving students in his work, Hedin helped lead the design, construction and operation of a DZero system for detecting muons, which proved to be important sign posts for scientists seeking evidence of the top quark, discovered at Fermilab in 1995. Hedin’s work also contributed to the discovery of other new particles and provided clues to the existence of the Higgs boson, discovered at the European laboratory CERN in 2013. Over the years, 200 undergraduate and graduate students have worked with the high energy physics group Hedin first launched – with more than 120 of them contributing to DZero. “If I can impact just a fraction of the students which Professor Hedin has influenced, I will consider myself a success,” says Michael Eads, an NIU assistant professor of physics who as an undergraduate began working with Hedin. The professor introduced Eads to particle physics research and mentored him through his Ph.D.
“I would not be where I am today without the guidance, influence and mentoring of Professor Hedin,” Eads says. He wrote about half of the proposal for NIU’s Ph.D. program in physics, approved in 1999. He revitalized and reopened the Davis Hall Observatory for night-sky viewings. He has supervised 21 graduate degrees. He initiated a successful physics outreach program, which grew into NIU’s STEM Outreach Program, now reaching tens of thousands of K-12 students each year. He has been a leader in NIU research efforts to develop a high-tech imaging system for proton therapy, a form of cancer treatment. He serves as deputy director of the Northern Illinois Center for Accelerator and Detector Development (NICADD) on campus. In 2011, he was elected a fellow of the prestigious American Physical Society.